ONE OF THE MOST BLINDLY ACCEPTED NOTIONS IN POP PSYCHOLOGY OF RECENT YEARS HAS BEEN THAT OF THE UNCANNY VALLEY. THE THEORY SUGGESTS THAT OUR IDENTIFICATION WITH ROBOTS INCREASES AS THEY BECOME MORE HUMAN-LIKE, BUT DROPS AWAY SHARPLY ONCE A CERTAIN LEVEL OF ALMOST-BUT-NOT-QUITE SIMILITUDE IS REACHED. Since Masahiro Mori first put forward the concept in 1970 research has been remarkably thin, and much of it refutes the proposal, yet it continues to be taken as fact by most who come across it. Because robots are creepy, right? To my mind the readiness with which we embrace the Uncanny Valley has cultural roots that edge dangerously close to naturalising discrimination. Hiroshi Ishiguro and Oriza Hirata’s “android-human theatre” is a case in point. The former is the world’s leading professor of human-like robotics, the latter a theatre director acclaimed for developing new performance methodologies based around an understated naturalism. 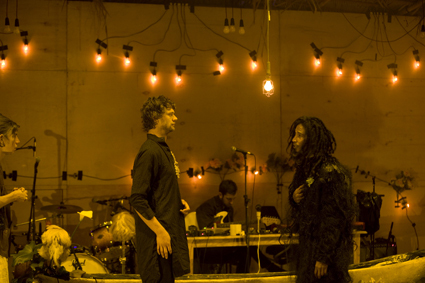 Both have been collaborating for some years, exploring the possibilities of a theatre practice involving androids as actors, and their work Sayonara recently brought them to Melbourne. The response to the work demonstrated the differing expectations that various cultures impose on the automaton. In western Judeo-Christian tradition, there is almost always something suspicious about the artificial person. Frankenstein’s monster and the Terminator are the two most familiar examples of the perils of taking the creator’s place, and posit the inevitable uprising and rebellion of machines against their makers. In contrast, according to Ishiguro, the image of the robot in Japan is more often one of companionship and exchange, which he traces to the Shinto and Buddhist traditions which still form the basis for much of his society’s imagining of the natural world. These categories of human/animal/robot are much less rigidly policed, he says. And so Sayonara isn’t concerned with maintaining the otherness of the automaton, but with the possibilities of compassion, connection and transcendence it may offer. A young girl (played by Canadian actor Bryerly Long) is confined to her home with a fatal illness. Her parents have provided her with a robot caretaker (Ishiguro’s Geminoid F), who sits by her side and reads poetry from across several centuries and continents. Their exchanges skirt delicately around issues of mortality, impermanence and loneliness. In the second act the girl is gone, and the android is visited by a technician who is tasked with locating her to an area near Fukushima too irradiated for humans. Her new job will be to act as a surrogate for our mourning, praying for the dead in our stead. We’re a long, long way from vengeful machines, here. The subdued, sparse fragility of the performance, its minimal visual palette and the way technology is presented mostly as a vehicle for poetry comes as a surprise to anyone steeped in the iconography of the untrustworthy robot. If an audience member experiences discomfort watching Ishiguro’s creations—and there was no evidence of such unease the day I attended—then it will act as a barrier against engagement with the very serious themes he and Hirata are interested in. And if the Uncanny Valley does exist, then it is, to Ishiguro’s mind, not a natural necessity but a cultural prejudice, something to get over. Can we draw a similar line to the representation of China in Australia today? Much writing and public discourse revolves around the idea of the nation as a superpower, demanding the deployment of warships to monitor its actions, a constant eye kept close upon it. The reality for many millions living on mainland China is of a vastly different order; the majority scoff at the idea that their country is a superpower, since it can’t yet provide running water or electricity to so many of its citizens. Fight the Landlord is a keen-witted take on the lived experiences of an aspirational Chinese society rent by deep fractures. The work, which unites Ireland’s Pan Pan Theatre and Beijing Square Moon Culture Company, presents three young women battling one another via the card game of the work’s title, drifting away in between hands into comic vignettes, heated debates and satirical pontification. The subjects of their conversation are seemingly superficial—gossip magazines, celebrities, housing prices and dating—and their constant clowning adds to this lightness. But the current underlying all of this only gradually becomes clear. Contemporary Chinese society, for this middle class, is one in which competition is demanded in every sphere of life, where people have internalised the idea that to get ahead you have to push someone else down, where the differences between yourself and your neighbour are the key to success. It’s not hard to see a pointed critique of an emergent capitalism here, and in thinking through the work’s subtext it’s equally easy to see its relevance to Australia of 2012. The design of Fight the Landlord virtually commands this engagement, too. The audience is seated on stage, in the round, immersed in a festive riot of plastic bamboo trees, fairylights and screens upon which surtitles appear. The players sit at an oversized red table, but just as often clamber under or over it and through the legs of the onlookers. It’s certainly the most striking reinvention of Arts Centre Melbourne’s Fairfax Studio I’ve seen—the sort of staging that drew gasps as attendees shuffled into the auditorium. There were similar responses as people arrived at Doku Rai, a collaboration between Melbourne’s Black Lung Theatre and Whaling Firm and Timor Leste companies Liurai Fo’er and Galaxy. Anyone who’s caught a Black Lung show before will be used to their astounding design aesthetic, of course. In this case, the audience enters the space in the middle of things, a shambolic band raising raucous rock hell amidst a ramshackle arrangement of plants, a canoe-bathtub, threadbare rugs, carved icons, trinkets, smoke and light. It takes a while before anything resembling a narrative presents itself, and it does so in furtive, sideways steps. The title (and subtitle, “you, dead man, I don’t believe you”) refers to a curse which can be cast on an enemy and which will result in their death. In this case a doku rai is cast by a man against his brother, but the dead man keeps returning from his grave, requiring another murder to send him back. The cycle keeps repeating, and goes from horrific to bleakly comic in turns, the hundreds of deaths meted out against the sorry figure attaining a level of excess that can’t help but result in laughter. At the same time a counter narrative imposes itself—that of the Australian director attempting to piece the production together. He’s a grotesque, a shouting, addle-brained colonialist whose idea of collaboration is really a one-way thing. Rather than engage in a conversation with his counterparts, he sees them as objects to be manipulated, and cultural curiosities to be exploited. Unfortunately this second element to the work isn’t realised with nearly as much acuity as the first—the director is such an inflated monster that he acts purely as an object of ridicule, and the thread serves in some way to safeguard against the possibility of similar breakdowns of communication within the work’s own development. Most of all, it affords its audience the satisfaction of recognising a dangerous mode of cross-cultural engagement without making us complicit in that danger itself. We’re never asked to investigate our own assumptions or desires, but simply to disapprove of someone else’s. Beyond this, however, does lie a thick and thorough dialogue with the recent history of one of Australia’s closest neighbours, both politicised and aestheticised with remarkable effectiveness. As the result of several months working together, the various artists here have forged a connection that should be admired, and which hopefully will continue to develop in intriguing and strange new ways. See Vicki Van Hout’s response to Doku Rai.